Saturday Night Live has returned from its winter break and is gearing up for the remainder of its very big 40th Anniversary season. 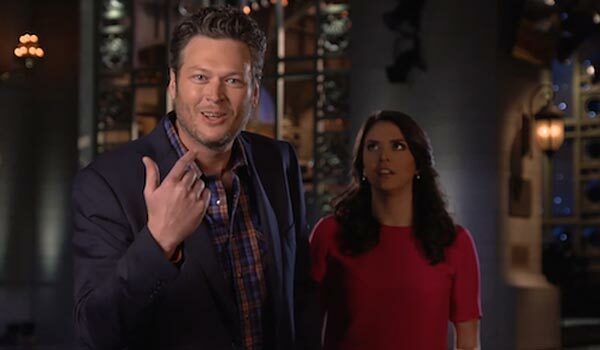 With Blake Shelton slated to make his debut as both host and musical guest on the late night sketch show this upcoming Saturday, SNL has released its latest promotional clip to help set the tone for the upcoming episode. Take a look as he and Cecily Strong help set the comedic stage for the country music singer/ television personality's big appearance this weekend, below. In the above clip, the duo can be seen poking fun at all things Blake Shelton, bringing in his height and southern roots, among other things. They also make sure to point the finger at Adam Levine, and Strong even asks whether his rivalry with of his fellow The Voice judge is real or just a product of the reality-based singing competition show. Shelton's mock anger with Levine (e.g. watching him hold himself back in order to not to start cussing the Maroon 5 singer) is actually quite amusing. Just check out that mock anger. Will Levine make an appearance to defend himself? We will certainly find out this weekend. The biggest laugh, however, in the above clip isn't at the expense of Levine but rather from the mocking of an episode of NBC's The Voice, with Shelton playing the contestant and Strong the judge, showing the country star has no problem poking fun at himself or the structure of his hit NBC reality competition series. Saturday Night Live is poised for a big year. This is the 40th anniversary of the longest-running sketch comedy show on television and the network aims to make an impression. Last week's guest was The Wedding Ringer's Kevin Hart featuring musical guest Sia. Following the episode with Shelton, we will see what J.K. Simmons (Whiplash) and musical guest D’Angelo and the Vanguard have in store for us. NBC also has plans to air a lengthy primetime special on Feb. 15, 2015. NBC's Saturday Night Live airs Saturday nights at 11:30 p.m. ET.